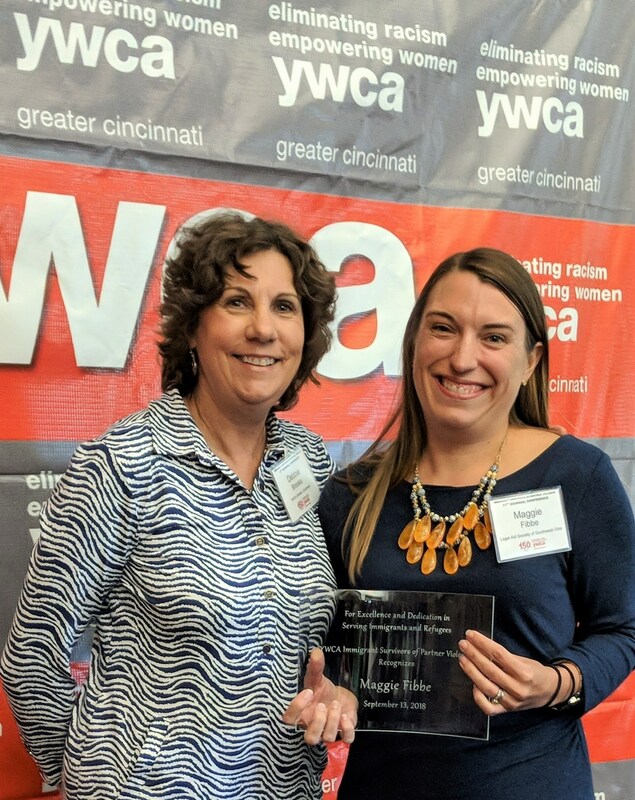 Congratulations to Maggie Fibbe, Legal Aid senior attorney, on receiving an award at the YWCA Immigrant Survivors of Partner Violence 11th Biennial Conference. “Maggie fights for her clients in both immigration and family courts until they achieve safety and stability,” noted Kelly Malone, Legal Aid Managing Attorney. Maggie received the award from Deborah Brooks, YWCA Executive Vice President, for her excellence and dedication in serving immigrants and refugees. Since she joined Legal Aid in 2007, she has represented immigrant victims of domestic violence. As Kelly Malone stated, “Maggie is truly a valuable asset to the immigrant community.” Congratulations, Maggie! Thank you for your tremendous work.